Owners Barbara Rush and Shanon Schneider. 70 local artists in our little gallery. and a boutique hotel will be replacing all the Historic shops of Webb Street. We will officially close our galley on September 1, 2018, but, continue online at www.SynergyFineArt.com until we decide the next course of action. August 18 from 2 pm to 8 pm. you can support your local artists while you still can! Romanticized Realism, Abstract Landscapes, and Local Live Music! Featuring art by local Roswell artists and photographers. Libations and Refreshments will be served. Connor Crank, Jaya Saxena, Alison Press, and Kirstan Howard. processes develop into painting before your very eyes. and get to know our artists and their inspirations. Thank you for supporting your local Roswell artists! 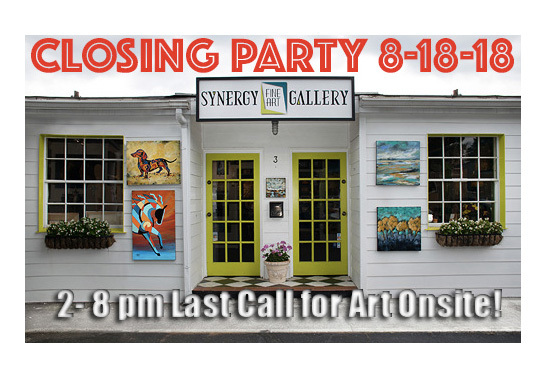 Synergy Fine Art Gallery is co-owned by Barbara Rush and Shanon Schneider. We provide a setting to support independent artists who paint and sell their art at the gallery and are dedicated toward advancing the careers of all of our artists as well as the reputation of Synergy Fine Art Gallery.